Thunderbird Paseo Park is located within the City of Glendale, Arizona. It lies within and along the north side of the Arizona Canal Diversion Channel (ACDC) from approximately 51st Avenue to 75th Avenue (Figure 1). The park was constructed by the City of Glendale after this reach of the ACDC was completed. 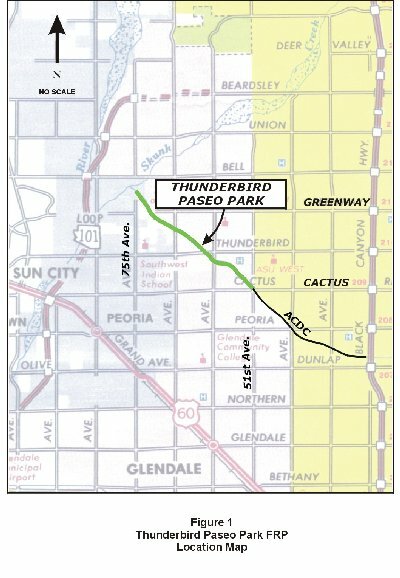 Because Thunderbird Paseo Park is located in the bottom of a large regional drainage channel, it is vulnerable to periodic flooding. There are two types of flooding which could pose a threat to occupants within the park during active flooding. First, general flooding of the ACDC occurs from runoff generated by large areas upstream of Thunderbird Paseo Park. Second, localized flooding from adjacent neighborhoods can occur in the vicinity of flood control structures that drain to the ACDC from the neighborhoods. These two situations are described below. General ACDC Flooding. During major storms, runoff from the northern areas of Phoenix and Paradise Valley enters the ACDC via large upstream washes. Large volumes of water may enter the ACDC and flood the channel. This creates a flood threat along the entire length of Thunderbird Paseo Park (See Figure 1). Localized Flooding at Drainage Structures. There are many structures along the north side of the ACDC which discharge directly into it. Many are small, and because of their size are not considered to pose imminent danger to passersby. However, a few are very large and may pose a localized threat to people in the vicinity of the structure. Potential Flood Vulnerability Locations. Areas of anticipated flooding, that are also likely to draw people because of nearby park facilities, are potential flood hazards. These areas are described in Figure 2 and Table 1. Concrete swale with grouted riprap conveys stormwater from adjacent Sweetwater Avenue to ACDC. Grouted riprap for adjacent parking lot and street drainage, and local small channel. Volleyball courts in the channel bottom upstream (northwest) of the 59th Avenue bridge. Playground in the channel bottom along the north bank. Basketball courts in the channel bottom downstream (southeast) of the Thunderbird Road bridge. 96-inch diameter reinforced concrete storm drain pipe. 84-inch diameter reinforced concrete storm drain pipe; Street-level parking; Passive exercise area in channel bottom. Large 25-foot wide gated structure with energy dissipaters that connect with the Arizona Canal. Pedestrian bridge over the Arizona Canal. Sidewalk traverses channel bottom and provides access from the south side of the ACDC. Pedestrian bridge over the Arizona Canal. Sidewalk to channel bottom provides access from the south side of the ACDC. Thunderbird Paseo Park will be subject to flooding in the future. The City of Glendale has the primary responsibility for emergency actions within the Park and will commit all available resources to save lives, minimize injury to persons, and minimize damage to property. Flooding may occur with little warning. Therefore, increased readiness measures and warning actions taken in advance of flooding are essential. To provide local notification of impending flood threat to residents within Thunderbird Paseo Park, emergency response to flooding, and expeditious recovery from flooding that would cause conditions hazardous to life and property within the Park. The National Weather Service issues weather statements, watches, and warnings to governmental agencies and to the general public. In addition, the Flood Control District of Maricopa County operates and monitors a network of automated precipitation gauges, stream gauges, and weather stations in Maricopa County, Arizona, including locations within the City of Glendale. Information collected by the National Weather Service and the Flood Control District of Maricopa County may be helpful to the City of Glendale in identifying a potential flood situation in Thunderbird Paseo Park. Upon notification by the National Weather Service and/or the Flood Control District of Maricopa County, the City of Glendale can reduce the risk of loss of life and property by alerting park users of a flood threat and committing available resources for flood fighting efforts. This Flood Response Plan includes activities before, during, and after a flood emergency in Thunderbird Paseo Park and includes the following four phases of emergency management. Notification by the Flood Control District of Maricopa County or its designated Meteorological Service Provider that weather conditions may develop into a flood situation for Thunderbird Paseo Park. Notification by the Flood Control District of Maricopa County or its designated Meteorological Service Provider that rainfall has been detected upstream of Thunderbird Paseo Park and conditions may develop into a flood situation. An issuance of a severe weather or flash flood warning by the National Weather Service combined with factors making the effect more imminent such as a severe storm sighting near or moving toward Thunderbird Paseo Park or its contributing watersheds. Notification by the Flood Control District of Maricopa County of observed flood conditions in and/or upstream of the Park. Observed floodwaters in the ACDC at or above the top of the low flow channel. Note that the flood condition criteria are guidelines only and cannot cover all scenarios of flood emergencies. The Mayor or City Manager or their designee also has the authority to declare a state of increased readiness at any time based on available information and impending conditions. 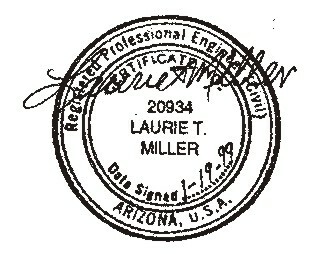 Review faxes sent by the Flood Control District of Maricopa County or its designated Meteorological Service Provider. Review National Weather Service daily forecasts. Distribute National Weather Service weather information to the Engineering Department. Monitor daily the weather information provided by the Flood Control District of Maricopa County over the Internet. Monitor any active or potential flood situations in Thunderbird Paseo Park during regular park patrols each day. Report any active or potential flood situations in Thunderbird Paseo Park to the Police Communications Officer. Review weather information provided by the Police Communications Officer. Notify the EOC Chief and all other departments included in this FRP of elevated FLOOD CONDITION 3 status. Monitor incoming weather information from the National Weather Service, Flood Control District of Maricopa County, and others. Notify the EOC Chief and all other departments included in this FRP (Parks, Public Works, Engineering) of elevated FLOOD CONDITION 2 status. Update the Glendale EOC Chief (Fire Chief) as needed on the developing flood threat. Dispatch a Park Ranger to patrol Thunderbird Paseo Park, or, if after hours, dispatch two police units (one for each side of the north and south park access points). When directed by the Police Communications Officer, dispatch a Park Ranger to patrol Thunderbird Paseo Park. Patrol the entire length of Thunderbird Paseo Park from Cactus Road to Greenway Road on the north side, and the access points on the south side of the Park. Identify the locations and number of people within the Park during its patrol. Notify people within the park of the impending flood threat by means of a mobile Public Address system. Report to the Police Communications Officer any water in the ACDC and/or significant floodwaters entering the Park from local storm drains. Monitor the Special Flood Vulnerability Areas identified in Table 1 and report any flood concerns to the Police Communications Officer. Provide the Police Communications Officer with current road information for roads in and around Thunderbird Paseo Park. Notify the EOC Chief and all other departments included in this FRP (Parks, Public Works, Engineering) of elevated FLOOD CONDITION 1 status. Coordinate with the Glendale EOC Chief (Fire Chief) as needed for activating the EOC or providing emergency response. Dispatch two police units (one for each side of the north and south park access points) to EVACUATE Thunderbird Paseo Park. Continue Police patrols until the flooding or flood threat has passed. Monitor the Special Flood Vulnerability Areas identified in Table 1 and report any flood concerns to the participating departments. If telephone communications are interrupted, access weather information provided by the Flood Control District of Maricopa County over the Internet in 15-minute intervals. Provide current road information in and around Thunderbird Paseo Park. Furnish and place road barricades to close the Park to traffic. Provide lights for night operations. Assist the Police Department in traffic and area control, perimeter security, and in rescue and evacuation missions. Provide debris clearance and removal within Thunderbird Paseo Park and adjacent City streets. If directed by the Police Communications Officer, dispatch a Park Ranger to patrol Thunderbird Paseo Park. If directed by the Police Communications Officer, monitor the Special Flood Vulnerability Areas identified in Table 1 and report any flood concerns to the Police Communications Officer. See Basic Plan for the flood response duties of emergency services staff. Contact the Park Ranger Supervisor to dispatch a Park Ranger to verify that a flood threat no longer exists along the length of Thunderbird Paseo Park, or, if after hours, dispatch a police unit. If a flood threat no longer exists, notify the EOC Chief and all other departments included in this FRP of the ALL CLEAR status. When directed by the Police Communications Officer, dispatch a Park Ranger to patrol Thunderbird Paseo Park to verify that the flood threat has passed. Patrol the entire length of Thunderbird Paseo Park from Cactus Road to Greenway Road on the north side, and the access points on the south side of the Park and report observations to the Police Communications Officer. Remove any barricades, except as needed to barricade hazardous areas. After a flood has passed and an ALL CLEAR has been issued, refer to the Basic Plan for post-flood recovery operations. Hold a practice flood drill once per year and simulate both general and localized flood conditions. All departments included in this FRP shall participate. The practice drills shall be held prior to the start of the monsoon season, and the National Weather Service and the Flood Control District of Maricopa County shall be invited to participate. Within two weeks after a practice drill, hold a post-drill critique meeting with all departments included in this FRP. If a significant flood occurs within Thunderbird Paseo Park, hold a similar post-flood critique meeting. Summarize input from post-drill or post-flood critique. If necessary, revise the Thunderbird Paseo Park FRP to incorporate information learned during the post-drill or post-flood critique meeting(s). Distribute the revised FRP to all participating departments, the Flood Control District of Maricopa County, and the Maricopa County Division of Emergency Management. 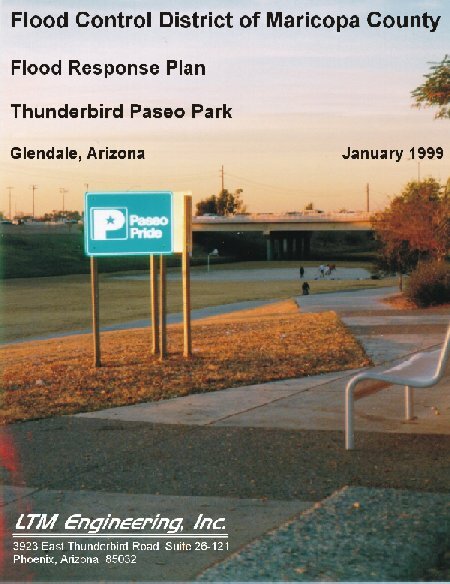 Develop pamphlets or other printed material which explain the dangers of flooding within Thunderbird Paseo Park, general flood response procedures, and what users should do if notified of a potential flood. Identify adjacent neighborhood groups and associations and distribute pamphlets before the start of the monsoon season. Update the information annually and re-distribute before the start of the monsoon season.